The origins of Photoshop: Card companies didn't strive for perfection in the 1970s, but when they realized they had a major problem, they acted. 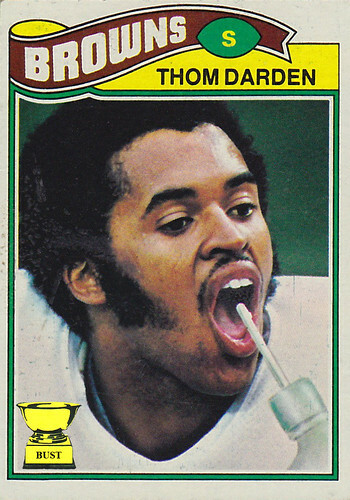 When Topps football executives were looking over the final photos to be used for their 1977 set, they realized only one shot of Thom Darden existed. This photo featured the Browns safety with his mouth gaping. But there was a difference between the photo and the card above: The water bottle wasn't there. Darden was on the sidelines, lips spread apart 6 inches like a failed "Rocky Horror Picture Show" movie poster model, but the photographer couldn't explain why. Darden didn't appear to be yelling. He didn't have documented breathing problems. And he wasn't drinking anything. So a Topps executive made a decision that drew from the genius of a 1952 Gus Zernial card and that would lay the groundwork for such classic cards as 1990 Topps Al Newman and 1990 Special Edition Bo Jackson. "Just paste in a photo of a phallic-looking water bottle, for chris'sakes," the executive told his imaging crew. "Now, let's move on to the next issue: scotch." The crew had never faked an image before, so they went to a small photography store a few blocks from the office, The Photo Shop, and made history.